While tonight’s game did not have the playoff implications that the Wildcats were hoping for, the game certainly had extra meaning as it was the last time that the team’s ten seniors would play in a Williston uniform. The Wildcats (13-11-2) defeated Pomfret (7-18-0) 4-1 in a game in which the Griffins got only eighteen total shots. Senior defenseman Jo Labrecque’s first period goal gave the Wildcats a 1-0 lead until the Griffins tied the game just over one minute into the third period. In each of the Wildcats’ previous three games, they held the lead at one point, but lost each of those games. But today, the Wildcats responded with three goals, two from junior Jack Kelly to help the seniors win their final game. Williston senior goaltender Elie Small made his first start in net for the Wildcats. While junior Shane Mason started just about every other, when Small has gotten playing time he has proved to be very reliable. In 90 minutes this season, Small let in just one goal posting a .971 save percentage. The Wildcats had three games this week and they needed to win at least two of them to reach the postseason. The Wildcats now have the same record against New England teams as they did last year at the end of the regular season; 12-10-2. This record kept the team out of the playoffs by .004 of a percentage point. It appears that the teams in front of Williston have better records this year than last year, diminishing any playoff chances. Of the team’s ten seniors, seven joined the team last year as repeat juniors. Many of these players have not yet decided where they will be next year. A popular option among prep school hockey players is to play a year of junior hockey before going on to college. In the next week, the team formally celebrates its season with team night when Coach Cunha announces the awards for MVP, Most Improved Player, and sportsmanship. Scoring three goals in the third period, Winchendon (11-12-2) piled on its goaltender to celebrate its comeback victory, one that very likely ended the Wildcats (12-11-2) playoff pursuit. The Wildcats held a 2-0 lead after the second period. Controlling the puck, Williston kept play in its offensive zone for the first thirty-six minutes. This was the second time in two games that Williston lost by one goal—losing 6-5 to Albany on Wednesday. In both games, the Wildcats held a two goal lead at one point. In this game on Friday, February 27th, the Wapitis scored all three goals within seven minutes during the third period. The first goal was scored less than four minutes into the period, with the last coming with 9:23 to play. This was the Wildcats third straight loss, three games the team needed to win to secure a playoff spot. In the locker room after the game, the coaches reminded the Wildcats that they had to put the game into perspective. Senior Brandon Bork scored the first goal for the Wildcats in the first period while senior Jared Karas added the team’s second before the midpoint of the second period. On Saturday, February 28th , Williston will play its final game of the regular season at home against Promfret (7-17-0). This game will celebrate the careers of ten seniors for whom this will be the last home game they play in a Williston uniform. A win in this game would give the Wildcats a 12-10-2 record against New England teams. This would tie the record of Williston’s 2013-14 New England record, one that had the Wildcats missing the playoffs by .004 of a percentage point. Midway through the first period, Williston Boys Hockey (12-10-2) held a 2-0 lead over visiting Albany Academy (15-11-2). But in the last 6:30 of the period, Albany scored three goals and the game was tied at three going into the second period. The Cadets scored two goals in the second, while the Wildcats only got one. Williston had eighteen minutes to be victorious in a game that had serious postseason implications. The final period started well for the Wildcats controlling play in their offensive zone. With 11:28 to play, senior forward Tyler Scroggins tied the game at five and the Wildcats gained momentum. In a game with sixteen penalties, it could be predicted that one of the teams would be sent to the box near the end of the game. With 4:29 to play, two Wildcats were sent to the box along with a Cadet. With a five-on-four man advantage, Albany scored a power play goal to take a 6-5 lead with just 3:53 remaining for the Wildcats to respond. Despite being on the power play for the last 1:53, Williston would drop its second straight home game. The Wildcats turned the puck over numerous times. Albany scored its second goal shorthanded on a breakaway off a Williston turnover in its offensive zone. In the locker room after the game, Williston senior captain Rourke Ferguson told the team, “In the end, we win our games, we lose our games. Williston sophomore forward Nick Schofield recorded three assists and scored the team’s third goal in this game. Both senior forwards Brandon Bork and Tyler Scroggins assisted two goals today, with Scroggins scoring one, as well. Albany’s two leading scorers, junior Kevin O’Neil and senior Nick Boyagian helped produce four of their team’s six goals. O’Neill scored two to bring his team-leading point total to 53. In these teams’ previous game at Albany on January 31st, the Wildcats prevailed 4-3. With just two games remaining, every game carries the weight of deciding which teams will make the playoffs. While the Wildcats may need some luck, the team’s postseason hopes are still alive. With the team’s final three games of the regular season this week, the 2014-15 Williston Boys Hockey (12-9-2) has the opportunity to make history as the first team in program history to reach the playoffs at the Division 1 level. With just three games remaining, each win this upcoming week would keep the Wildcats in control of their playoff fate while each loss would leave them at the mercy of the playoff computing system. In the team’s three games last week, the Wildcats did not quite get the results they were hoping for. Williston did pick up a very exciting and important win over Westminster on February 16th. The second two games of the week, against Canterbury and Deerfield, resulted in a tie and a loss, respectively. The loss against Deerfield came in the teams’ annual rivalry games, held at Williston this year. The Wildcats’ three games this week are against Albany, Winchendon, and Pomfret; these teams have a combined record of 31-39-2. Despite this record, these are games Williston must win if it hopes to play in March. For tomorrow’s home game against Albany Academy (14-11-2), the Wildcats will make a few changes to their usual forward lines. Coach Cunha said that this change will hopefully create a “spark” in the team’s play, something it lacked in its previous two games. Players who contribute significant amounts of the team’s offense have been distributed among three lines. The last meeting between Williston and Albany resulted in a 4-3 win for the Wildcats. Next, on Friday, February 27th, the Wildcats will face the Winchendon Wapitis (10-12-2) for Williston’s final road game of the regular season. Williston has already beaten the Wapitis twice this season by scores of 4-3 and 5-2. This upcoming game is the last of the regular season for Winchendon. The Wapitis will be fresh as their second to last game, a loss, was played this past Friday. The Wildcats host their season finale on Saturday afternoon. This game will have added meaning as the team will celebrate their seniors in their last regular season games. But after the festivities, the Wildcats will have a game to play that could decide their season. Facing Pomfret (7-16-0), these two teams have not yet met this season. Follow the team’s Twitter feed, @WillistonHockey, for live game tweets and the latest updates on the team and the playoffs. However, that goal never arrived as Deerfield controlled the final 36 minutes en route to a 5-1 win, the Big Green’s third of the season. In front of the biggest home crowds in recent memory at a hockey game, the Wildcats were unable to impress fans in these two teams’ annual rivalry game on Friday, February 21st. Over the final two periods, Deerfield scored five goals, two in the second, three in the third. Many of these goals were scored in transition, catching the Wildcats off guard. Williston’s lone goal was scored by senior forward Tyler Scroggins. His ninth of the season, Scroggins leads the team with 32 points. A team plagued by injuries, Deerfield saw production from an array of players tonight. Five different players scored each of the Big Green’s goals and six members of the team recorded points. Deerfield goaltender Samuel Vigneault was outstanding in this game making 38 saves (.974%). Especially on the Wildcats’ power plays, the sophomore was the reason Williston scored only one goal. Coach Cunha, looking for something to reignite the team’s play, decided to switch up the lines before the final eighteen minutes. This was the third straight year that the Wildcats have lost to the Big Green in this game. Coach Cunha’s message after the game was that the team needs to look forward to next week, one that decides the team’s playoff chances. With three games, all against teams the Wildcats have previously defeated this season, three wins would almost certainly guarantee the Wildcats a spot in the playoffs. Two wins would probably get the job done, as well. The Wildcats will continue their playoff push at home against Albany Academy (14-10-2) on Wednesday, February 25th. In the last eight days, Williston Boys Hockey 12-8-2 has played four road games with just one day of rest and practice between each one. Each of those four games was decided by two or fewer goals. In this span, the Wildcats have won two games, tied one, and lost one. In this last part of the regular season, every game can change the team’s destiny, which is, the team hopes, to land a spot in the playoffs. This past Monday, the Wildcats played Westminster in a game that was originally scheduled for February 2nd. Williston defeated the Martlets in thrilling fashion. With less than five minutes to play and on the power play, the Wildcats were cycling the puck around the offensive zone when senior forward Jared Karas took a slapshot that when between the Martlet’s goaltender’s legs and into the back of the net. Westminster was one of the fastest teams the Wildcats have faced this season. The Martlets were also exceptional at moving the puck and making passes that opened up space for themselves. But at its best, which the team was on Monday, Williston can match the level of play of any team. Although the Wildcats entered the third period down by a goal, they certainly were not out of the game. Junior defenseman Brad Budman was a player in this game who made a positive difference for the Wildcats. Like his defensive partner, Chris Dumont ’15, Budman played offensively helping the team to bring the puck into the offensive zone. In today’s game at Canterbury, the Wildcats were unable to conjure up the same magic. Holding a 3-2 lead at the start of the third period, the Saints scored just over five minutes into the period. Despite both teams getting chances to break the tie, the game went to overtime and ended as a draw. The Wildcats beat themselves in this game as they went to the penalty box nine times. The last time Williston played Canterbury this season was back on November 22nd. The Wildcats won the season-opener 5-2. Senior defenseman Chris Dumont scored the second and third goals in the game for the Wildcats today. A very offensive player, Dumont leads Williston defensemen with five goals and fifteen assists. He is second on the team in points. With a few Wildcats not playing due to injury and sickness, every other member was called on to make a contribution to this game. One of them was sophomore Connor Lynch. In his first year on the team, Lynch gets occasional shifts on defense, but today he saw increased action on the ice as a forward. In the final minutes, he helped create scoring chances. With a lethal power play, Canterbury scored two of its three goals with the man advantage. The Saints did start the third period with a 5-on-3 power play and got another advantage midway through the finalperiod, but they could not get the puck past Williston’s defense. In a push for the playoffs, the Wildcats have won six of their last eight games. They have five games left against opponents with a combined 31-53-7 record. In just two days, the Wildcats will take on Deerfield in the teams’ annual rivalry game. Last season, the game was held at Deerfield, but this year Williston expects a big crowd to give them the edge at home. For this game, the team is selling “Beat Deerfield” shirts with the proceeds going to Movember, an organization that works to improve the health of men living with serious health issues. In a game with few lapses, Williston Boys Hockey (11-8-1) dominated Millbrook (9-15-3) for large portions of each period and captured a crucial 3-1 road victory on February 14th. This was the second time this season the Wildcats defeated the Mustangs to complete the season sweep. The previous game was played at Williston on January 28th; the Wildcats narrowly won 4-3. Williston scored one goal in each period. Sophomore forward JoJo Carbone scored his eighth goal of the season with just under two minutes to play in the first to give the Wildcats a 1-0 lead. The second period included a very exciting moment when junior Tiger Lindsay scored his first goal as a Wildcat to give Williston a 2-0 lead just under five minutes into the period. Earlier this season, Lindsay was moved to the forward position after spending all of last season as a defenseman. These two teams certainly did not play like it was Valentine’s Day; multiple roughing penalties were handed out to both teams in the second period. In the third period, the Wildcats were abe to stay out of the penalty box and did not hand the Mustangs an advantage. The Mustangs cut the Wildcats’ lead to one with eleven minutes to play, but despite pulling its goalie at the end, Millbrook did not score a second goal. With an open net, senior forward Jared Karas sealed the deal with eighteen seconds to play. Millbrook, a team with a dangerous top line, was never out of this game. The Mustangs got more than enough chances to tie or even win this game. The Wildcats relied on their starting goaltender, Shane Mason ’16, to defend a number of odd-man rushes. Mason prevented 33 of 34 (.971) pucks from entering the net. After an untimely 5-3 loss to Northfield Mount Hermon this past Wednesday, the Wildcats got themselves back on the right track to secure a spot in the playoffs. With just six games remaining, each game could make or break the team’s playoff chances. One week ago, Williston Boys Hockey (10-8-1) defeated the number two team in New England, Loomis-Chaffee. The Wildcats never trailed. In that game, Williston set the pace and ultimately won the sprint at the end, defeating the Pelicans 4-3 in overtime. In today’s game against Northfield Mount Hermon (NMH) (11-13-0), the Wildcats were constantly playing catch-up; Williston never held a lead in a 5-3 loss. NMH took control from the start of the game, scoring two goals in the first eight minutes. Within the next eight minutes, the Wildcats tied the game with goals from line-mates Brandon Bork ’15 and Rourke Ferguson ’15. Both teams scored once in the first two minutes of the second period. Sophomore forward Nick Schofield scored for the Wildcats to tie the game at three. The rest of the second period remained scoreless until the Hoggers got a break when the puck bounced off the back of Williston goalie Shane Mason’s pad on a shot behind from behind the goal. Schofield ’17 was playing in his first game since January 16th when he suffered a knee injury against Winchendon. Schofield is usually a winger on the team’s top line and provides a significant amount of the team’s offense. For precautionary reasons, Schofied was available in a limited role today as he rotated in on the team’s third line. NMH’s top line was a force in the first two periods. Led by senior forward and team captain Ben Freemen, a UCONN commit, this line was involved in the team’s first four goals. The Hoggers’ leader in goals (18) and points (30), senior forward Peter Owen Hayward scored his team’s second and third goals. The Wildcats controlled play in the third period peppering NMH goaltender Conor O’Brien with shots. O’Brien was a key player in this game–he made thirty-eight saves (.927 %). In the last six minutes of the game, the Wildcats had four minutes on the power play. O’Brien provided huge saves for NMH, not allowing Williston to tie the game. With just over a minute to play, the Hoggers scored an open net goal to seal the win. Up next, Williston will face Millbrook (8-14-3) on Saturday on the road. On December 19th, Williston Boys Hockey had a 1-5 record. It wouldn’t be until January 14th that the Wildcats returned to a .500 winning percentage. Since that date, the Wildcats have won five of six games, losing just once to Berkshire. This brings the Wildcats to a 10-7-1 record, one that puts the team in the middle of a race to reach the playoffs. Most recently, the team gave the Williston Boys Hockey program one of its biggest victories in recent history. In front of a home crowd this past Wednesday, February 4th, the Wildcats stunned Loomis, beating the Pelicans, at the time the number two team in New England, 4-3. Just 23 seconds into overtime, sophomore JoJo Carbone gave the Wildcats its first overtime victory since January 21st, 2009. This win powered the Wildcats into the top fifteen New England prep teams, the first time Williston has appeared in a poll this season. Hockey Night in Boston’s February 8th Prep Poll ranked the Wildcats at number fourteen. USHR’s RPI (Rating Percentage Index) is a fluid ranking system that rates teams taking into account the winning percentage of opponents. Currently at number fourteen, Williston has had the toughest schedule of any team in the top fifteen. The Wildcats’ opponents’ winning percentage is .6053. To give this some perspective, the average winning percentage of the opponents of the top thirteen teams is is .512. In this last stretch of the season, Head Coach Derek Cunha’s motto for the Wildcats has been: “our practices are our games and our games are our playoffs.” This emphasizes that the team must take advantage of every opportunity it has on the ice. This hits home for a team that missed the playoffs last season by .004 of a percentage point. Luckily for Williston, the Wildcats’ remaining schedule only helps the team make playing in March a reality. With just eight games remaining, the Wildcats have previously defeated four of those opponents this season. Three of the remaining four opponents have a sub .500 winning percentage. The one opponent who the Wildcats have not beaten and who does not have a losing record is Westminster. Williston’s game against the Martlets was originally scheduled for February 2nd, but was cancelled due to weather. The game has been rescheduled for this upcoming Monday, February 16th, at Westminster. Wednesday, February 11: Williston @ NMH, 3 p.m. Looking for their eleventh win of the year, the Wildcats will travel to the Northfield Mount Hermon to take on the Hoggers (10-13-0). Last season, NMH finished with a 19-10-2 regular season record. They earned a spot in the playoffs and were quarter-finalists in the Large School Tournament. The Hoggers have lost their last two games this season to Kimball Union and Vermont Academy by a combined six goals. The team’s leader in goals (16) and points (28) is senior forward Peter Owen Hayward (#17). The team’s leader in assists (16) is senior forward Ben Freeman (#24). Freeman has committed to play Division 1 hockey at UCONN. Saturday, February 14: Williston @ Millbrook, 2 p.m.
For the second time this season, the Wildcats will meet Millbrook (8-13-3) on Saturday. In the teams’ first match-up on January 28th, the Wildcats squeaked out a 4-2 victory at home. This time, Williston will travel to the Mustangs’ barn in southern New York. Since the teams’ first game, Millbrook has lost two games to Brunswick and Gunnery to increase its losing streak to five. 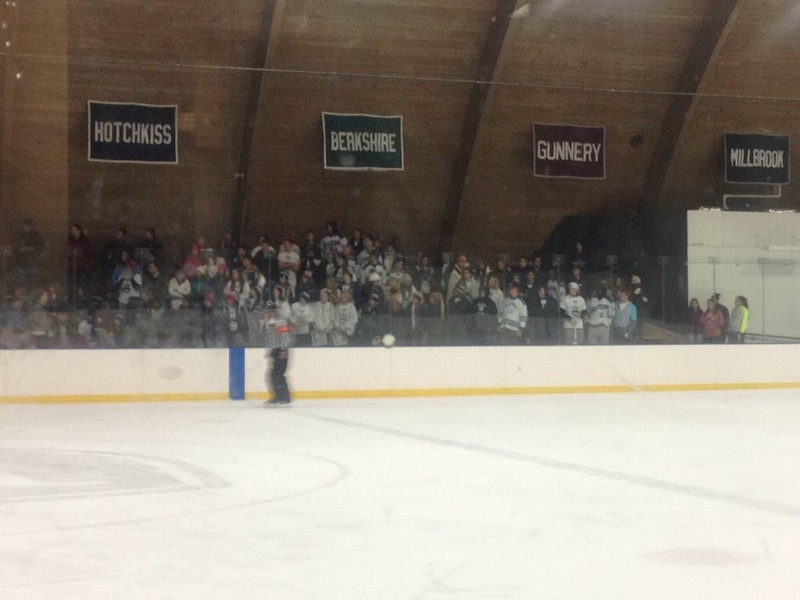 The Mustangs’ last victory was against Pomfret on January 17th. Since January 28th, Williston has won its two games; the Wildcats have won six of their last seven. Millbrook sophomore forward Matt Gosiewski, a Harvard University commit, is the Mustangs’ leader in assists (22) and points (27). Sophomore forward JoJo Carbone darted down the right side of the rink chasing a puck that had been flipped high in the air into the offensive zone. He beat a defender and just twenty-three seconds into overtime Carbone ’17 slipped the puck past the Loomis (17-3-0) goaltender. This goal gave Williston Boys Hockey (10-7-1) a 4-3 victory over the number two ranked team in New England on Wednesday, February 2nd. The first period ended in a one-to-one tie with Jack Kelly ’16 scoring Williston’s goal. The Wildcats went into the third period with a 2-1 lead. Less than four minutes into the period, the Pelicans tied the game. But on Williston’s next and last power play of the game, senior defenseman Chris Dumont passed the puck to senior forward Jared Karas who unleashed a slapshot that sent the puck into the back of the net. As the Pelicans had each time in this game, Loomis scored to tie the game with just under three minutes to play in the third period. At no point in this game were the Wildcats ever losing. Yet, Williston never held more than a one goal advantage over the visiting Pelicans. Loomis took control of the first period after the Wildcats scored their first goal. The second eighteen minutes of this game was one of the best periods Williston had played all season. The team put pressure on Loomis’ defense and the Wildcats did not have any defensive lapses. Brandon Bork ’15 scored midway through the period. The team’s one mishap in this game was conceding a power play goal to let the Pelicans tie the game at one in the first period. In USHR’s latest poll posted on February 2nd, Loomis was ranked just behind Exeter, the top New England prep team. Today’s loss was Loomis’ second in the past ten days. This is uncharacteristic of a team that started its season with nine straight wins.